The “face” is the most important thing to get right on an enclosure so I was very concerned by the enormous “WESENA” logo located on the unit. There is some good news, and some bad, when it comes to this however. 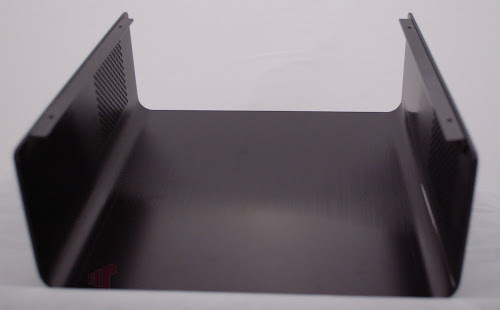 The good is that there will be two differences between this case and the second iteration of the chassis; one is that the logo will be a much more discrete 1” wide and located on the top left corner and secondly the color of the feet in the final units will be color matched with the case – black for the black chassis and silver for silver. On the other hand, the second revision is still a few weeks out and with two versions in the channel there is potential for confusion so some clarification may be required to ensure expectations are in-line with the final result. Along the bottom of the case we find the power switch, power LED, two USB, Secure Digital card slot and infrared (IR) receiver, with space for a slot loading optical drive located on the top. Similar to other chassis with hidden optical drives, the ITX7 includes a small plastic nub on the bottom left of the slot for actuating the drive’s eject button. The used Sony BC-5600S I picked up on eBay did not have a physical eject button so some electrical tape was used to secure it to the front panel. It is also worth pointing out the almost perfect amount of light output by the power LED, because it is something so many HTPC cases get wrong; going way too bright. Given the heft, I was not surprised with the thickness of the aluminum used in the chassis. The ITX7 has a very solid feel to it with plenty of slots for allowing air to flow inside the case when using an exhaust fan. There are no slots located on the top however so natural convection will be somewhat limited if opting to forgo active cooling. It is also worth noting that because of its size, the ITX7 does not have space for a traditional ATX power supply unit (PSU) so a pico-PSU or similar will be required; a hole directly above the rear I/O panel is provided for the plug. 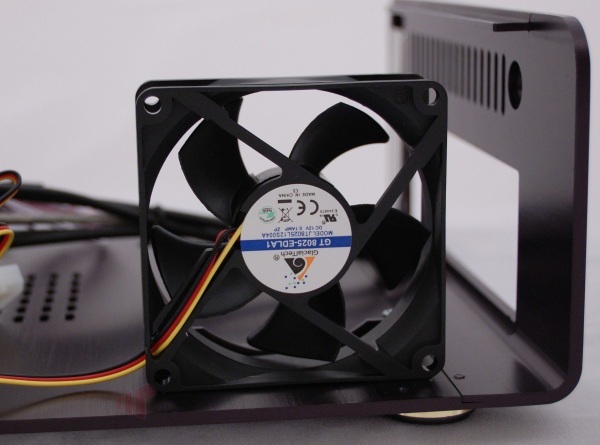 The case includes a mounting bracket and 80mm GlacialTech oriented for use as an exhaust fan. While I did not experience any issues with its cooling performance, the fan did make an audible clicking noise in operation so it was replaced with an Artic Cooling 80mm PWM (four pin). To be fair, I am very sensitive to fan noise and it was not noticeable in all of the environments, only those with a low noise floor. A bracket for the optical drive, one 2.5” (bottom mount) and one 3.5” hard drive is provided. 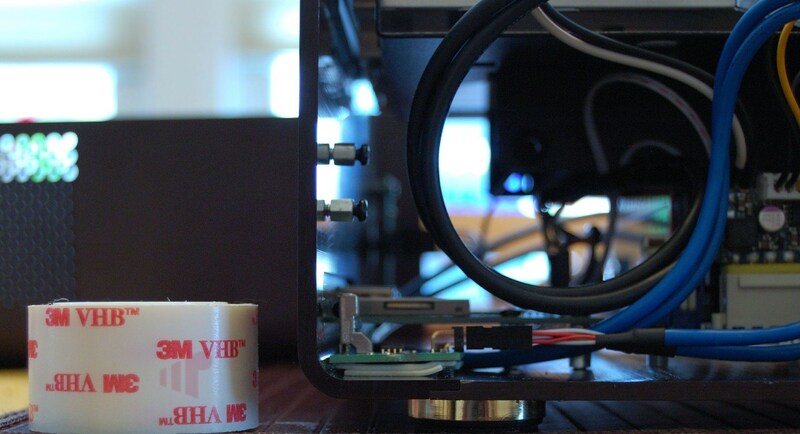 The 3.5” mount includes vibration isolators but installing a device requires a low profile CPU heat sink and fan (HSF) so it was not tested – check out the build gallery for a picture of the overhang. Overall working with the case was straightforward with very few issues noted during the build. The only major challenge was encountered when trying to get the drive bracket back into the enclosure with the motherboard installed because the HSF was blocking it. Resolving this required removal of one of the sides; where it was not immediately obvious that three screws secure each side of the case to the bottom, and the feet must be detached to access the two on the edges. The case does have some minor fit-and-finish issues consistent with other enclosures at its price point. The most notable is that the optical drive required a slight shim to get it aligned perfectly with the slot. Built in infrared (IR) is huge bonus for the HTPC seeking to blend perfectly with other A/V components, so I was very pleased to find that that the ITX7 comes with an IR receiver. The sample did not come with a RC260 or RC153 remote supported by the receiver (an optional accessory) so without an easy way to train my Harmony I tried to drive it with a standard RC6 Media Center remote – which did work but only partially. Since the receiver does not fully emulate an eHome device not all of the buttons work (e.g. back does not go back) and some function in unexpected ways (e.g. page up/down are reversed), so after some frustration I ended up just replacing it with the Intel CIR receiver supported on the DH67CF motherboard. To be clear, this anecdote should only be taken in the intended context — even when something does not work as expected, it was great working with a case with the flexibility to create a solution. Several PCI-e add-in cards were tested for size in the case, including two tuners and two discrete GPU. All of the true single slot devices installed and functioned perfectly, but our “single-and-a-half” low profile NVIDIA GT430 card’s HSF was too large to allow the top to be installed– something to be aware of during component selection. Those who saw our Core i3-2100T review the temperature numbers noted above for system idle, Blu-ray playback, Quick Sync and CPU transcoding will be familiar as they were captured in the Wesena ITX7. Clearly even under stress the case was able to handle the heat load placed on it with minimal fan spin-up. Only considering the thick brushed aluminum construction, built-in IR and the right look for home theater integration the Wesena ITX7 has tremendous potential to service those requiring a quality SFF HTPC enclosure for a DYI build; factoring in the price of $99 I think Wesena got the cost-to-value ratio with this chassis just about right. Our sample was not perfect however; with a logo featuring poor size and placement on the chassis and some minor fit-and-finish issues. Fortunately an updated version will be arriving in a few weeks to address the logo; a welcome change but one that also carries the potential for confusion. I ordered a Wesena case from Perfect Home Theater, and it promptly was shipped back. Their logo doesn’t belong on the front face of their cases at all; even if they shrink it down, and move it off center. Really nice cases, but it’s a shame they have to ruin it with logos on the front face of the case. They will probably lose a lot of potential customers because of that. Do you think there’d be any way to polish the logo off? Though the small one won’t be too bad. On the silver one I think it would be possible to polish it off with sugar. The black cases are painted, even a mild abrasive would probably remove the black paint as well. I’m not sure it’s anodized; but if it would you feel better how about if just I say rubbing it with a mild abrasive would probably damage the black case? That said, it would be easy enough to do a test on the inside of the cover where it doesn’t matter (next to where they missed a spot :)). I’ve definitely seen anodized aluminum have the color wear off so definitely test. Even the silver probably has a clear coating so that it doesn’t change color so it may also not be such a good idea to use an abrasive on it. Maybe instead of an abrasive, you could try some chemical removal. I have removed the silk screen logos off of literally hundreds of aluminum HTPC cases. It is quite easily done with paint remover purchased from Home Depot. I forget the brand, but in came in a red and gold pint can. Basically apply the paint remover with an acid brush, let stand for about 5 minutes and wipe off with a wet cloth. Do not leave on too long and avoid contact with the paint remover. Make sure to not get any remover on plastic or other painted parts. I would also suggest trying this first on the bottom of the case to make sure it is safe. Yesterday I took two ITX2, two ITX6, two ITX6 no IR and two ITX7. I check them with Sony Optiarc SATA Slim Slot Blu-ray DVD Combo BC-5600S. The same model used in review but mine drives are fully functional with eject button. All eight chassis have no problem with ODD, fit was perfect. 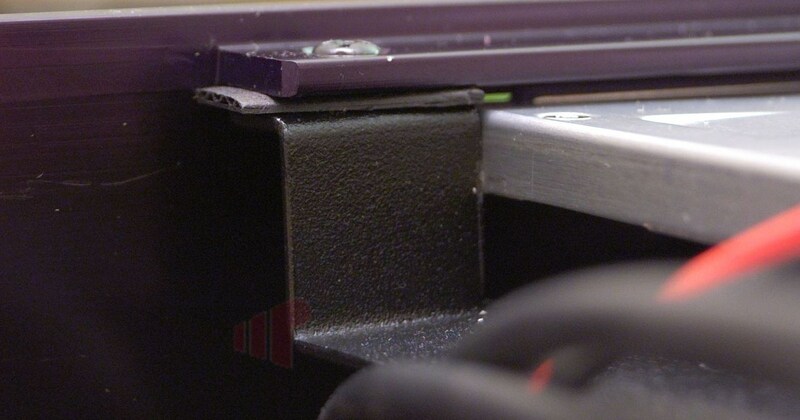 In one of them left side was ~1/64″ higher than right, but slide push on the bracket solved this problem. I think that problem was with Laptop BluRay or Andrew got a lemon. It’s not unusal for there to be variations in chassis, especially considering the number of discrete parts (4 + drive) involved in getting the fit perfect. As long as the defects are minor and correctable (like this one) it shouldn’t be considered blocking. Every case I’ve used has had some issues, and I don’t think the minor fit and finish issues are inconsistent with the price point. Like I said in the review “Wesena got the cost-to-value ratio with this chassis just about right”. I’ve also found some nice ripping servers at http://www.zoneripper.com that look familiar designs…. Has anybody here tried one of the E5 or E6 cases? I was excited about the case until I read the problems regarding the IR remote. Too bad. FYI, I spoke with the distributor in Massachusetts yesterday. He is expecting a shipment of ITX7s (at least) without any logo within the next seven to ten days. they are in stock now — if the logo doesn’t bother you, the logoed versions have been dropped to just under $75/ea. I’m still wondering what the original designer was thinking when putting that massive logo there. It’s one way to get your name out there! What brand/model IR was included with the case? Any ideas on why it didn’t work properly or if they plan on switching to a better IR module? How complicated was the IR module swap out? The IR receiver should work with a RC260 or RC153 remote, my only point was that it wasn’t an RC6 (i.e. Media Center) receiver so it you’d either have to buy the remote, know how to program a Harmony (hopefully someone has put in the codes by now) or plan to replace it with something else. I didn’t think to ask for the remote and I needed to test the replacement receiver with the DH67CF anyway so I just went with that. It was really easy to swap out, just remove the screws and use some foam tape to secure the replacement to the base of the case if it doesn’t fit on the original holes. New ITX , e5 and eHDD chassis are without logo and in stock. I am in the process of building my 1st htpc using this case (w/o logo), the same motherboard, processor, CIR receiver, and initially the same g.skill memory sticks (2x2GB ilo 1x2GB) along with a 2.5″ ssd, and 3.5″ hdd. For me, it was the heat sinks on the g.skill memory sticks that were too tall (not the HSF on the processor) to allow the bracket to be reinstalled without taking off one of the sides. In lieu of doing that, I replaced the memory sticks with ones that didn’t have any heat sinks and was able to slide the bracket back into place. Did you just use the stock heat sink for the i3-2100T? Any problems with this? How noisy was it – would there be other Hetasinks that might work better – even one without a fan as you may get enough air moving from the case fan. I used a retail i5 cooler, and it was very quiet. The i3’s put out so little heat that I don’t see a need to go aftermarket, but if you did it should be possible to use a passive HSF with the case fan. Thanks for a great review. I’m about to do a HTPC-build using one of the Wesena ITX cases. Do you know if it will fit in either of ITX2, ITX6 or ITX7-2 cases? With a little tape or sugru you should be able to install almost any receiver in the chassis (I use an Intel compatible CIR taped to the bottom). FWIW, I haven’t used the HD-PLEX receiver personally, but I’ve heard that it isn’t completely compatible with 7MC. OK thanks. I was more concerned if the size of the pcb is too large so that it won’t fit. Thanks also for the compatibility issues heads up. However I’ll think I’ll just have to go with the HDPLEX one as I haven’t found another MCE IR-receiver that supports power on from S5. The HD-PLEX IR receiver only supports ON from S5 when in a HD-PLEX chassis. When you purchase standalone it doesn’t come w/ the PCB for it. Another option is the SIMEREC Universal IR Remote Control PC Power Switch (PCS-2). I’ve looked at the SIMEREC one but isn’t that just for powering on the pc? Then you’ll need another receiver to receive other commands once in mce or any other media center? Also if you just supply the HD-PLEX IR receiver with 5VSB from the power supply there’s no need for the extra PCB that’s in their cases as far as I can tell. Yes the SIMEREC is just for ON from S5. You would still need another IR receiver.